I now have both android and apple phones and I have been comparing the two. Thus far, the biggest difference is how they utilize screen size. 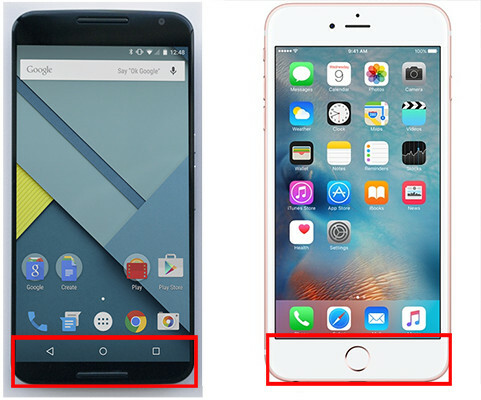 You can see how I have highlighted the bottom of the phones in the image below. For some reason apple makes you press a button. This button is a huge pain to press if you are used to just tapping the screen. And its a huge waste of screen space. Android has definitely done a better job of utilizing the screen here and I would imagine apple will follow suit shortly. This might not seem like a big deal but once you get used to tapping the screen you never want to constantly keep pushing that button all day long.